As a property manager you have a lot on your plate. In addition to your everyday tasks, you’re constantly under the pressure that an applicant might potentially be upset over being denied and who will try to find something illegal about your rental policy. A customized decision model erases any assumptions that your rental policy might be based on subjective and discriminatory factors. By taking advantage of automated decisions on your tenant screening reports, you have the ability to expedite your approval process while demonstrating a consistent rental policy to applicants. That being said, the big question is: what exactly is a decision model? In short, it’s a checklist of your rental requirements (set by your company) that automatically determines whether an applicant should be accepted, denied, or have conditional requirements. Some of the things you can customize on your decision model are acceptable Experian National Risk score and FICO score ranges. You can also set the risk levels of past due tradelines, repossessions, and other factors. Regardless of what your rental requirements are, a decision model will be able to take the information available for each applicant and quickly tell you whether they will make a trustworthy renter, all based off your company’s pre-selected criteria. While it’s understandable to be leery about letting go of the final rental decision, ultimately it makes your job easier! As a property manager, you’ll have more time available to dedicate to advertising listings, managing events, and communicating with your residents. 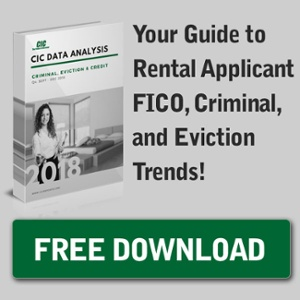 Without compromising your company’s rental standards and integrity, you’ll be able to quickly and accurately make a decision about applicants without the need for manual review. With a decision model you’ll be able to objectively show applicants why they were denied using a list of ‘red flags’ that let you jump to the areas of their report that were problematic. For your company, having a set decision model uniforms the rental process and makes sure that there are no discrepancies between properties. Although the perks of having a customized decision model are there, the effectiveness of your decision model depends on the quality of background information you use. If you don’t believe you have quality resident screening information on your background screening reports then you might not be selecting the most qualified applicants whether you use a decision model or not. Ultimately your decision model is backed by the same quality background screening information you trust. Using a decision model to help you uphold your company’s standards, avoid fair housing violations, and quickly fill available listings has its benefits. However, those benefits are only fully utilized in conjunction with quality background screening data. For more information about CIC’s customizable decision model, CrosXScore, visit our website or contact your current sales representative. Do you currently use a decision model in your rental process? If not, what characteristics would you need on your decision model? Let us know in the comments section & be sure to subscribe!